Win some holiday cash for yourself and your favorite charity by entering a Social Media Event unlike any other we've ever heard about. Sponsored by Two Little Cavaliers and some amazing pet bloggers, this contest is bound to bring a smile to your face because it's so easy to enter. And not only will the winner of the event receive $112 cash (via Paypal), but they'll also get to name an animal charity near and dear to their heart that they would like a $213 donation sent to. All you need to do is use the Rafflecopter tool below to enter for your chance to win. You'll have several chances to win! Today you need to comment on this blog post, telling us your favorite pet charity that would get the donation if you're the lucky winner. It can be any animal organization that is a 501c3 or properly recognized charity in your country. Later we'll feature the Facebook pages of some of our favorite pet blogs. "Like" some of these barking good folks and earn up to 27 entries. Follow as few or as many of them as you like. Remember, the more "likes," the more entries you'll get. If you're not a Facebook user, don't worry! 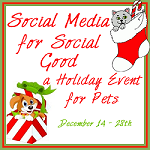 On December 18, Twitter users can get in on the fun to "tweet" for 27 entries. And on December 22, Google+ users can earn entries, too. If Talking Dogs would be the lucky winner, we'd donate the entire $325 to Stray Rescue. We've barked about Stray Rescue here. Don't forget... You MUST complete the Rafflecopter below in order to be entered! Tell us: if you're the lucky winner, who would get your animal charity $213 cash donation? I want my donation to go to Tony La Russa's Animal Rescue Foundation, ARF, located in Walnut Creek, CA.